These are not what I had envisioned. Nope. Not at all. 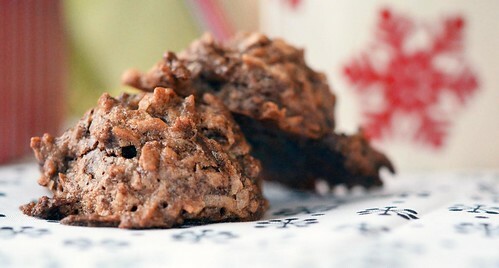 I envisioned lightly browned coconut dollops, studded with mini chocolate chips. That was the picture I had in my head. However, what emerged from my kitchen held no resemblance to my original idea. Zero. Zip. Zilch. You see, when you fold chocolate chips into a warm batter/dough …they will melt. Even with all those chemical solidifiers and stabilizers…they still melt. As I was pouring the chocolate chips into the batter/dough, I thought to myself, these are going to melt…but it was too late. The damage was already done. They were melting right in front of my eyes. The image in my head of lightly browned coconut dollops was quickly fading…and an image of me running back to the grocery to buy more coconut was taking its place. Before I took made another trip to the grocery (it would have been #3 for the day) I decided to just go with it. 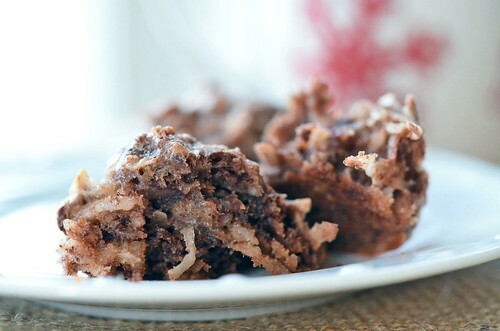 So, I went ahead and folded all the chocolate into my lovely white coconut batter/dough. Scooped and baked them. 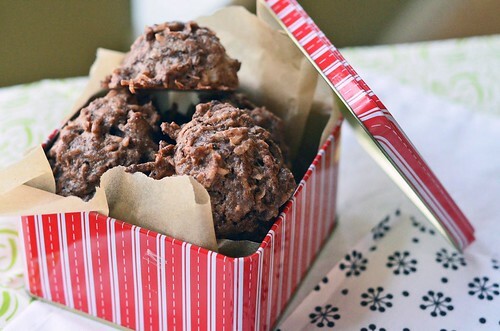 Chock full of coconut and chocolate with a crisp exterior and a lovely chewy center, I dare you just to eat one! 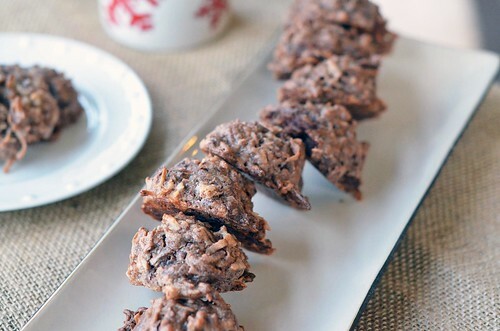 If you are a coconut lover … you will love these. Guaranteed. In a heat proof bowl ( I used a glass pyrex bowl), stir together egg whites, coconut, sugar, and vanilla extract. Place bowl over a pan of simmering water (about 2 inches deep) creating a double boiler. Cook mixture until it thickens, stirring occassionally – about 10 to 15 minutes. The correct consistency is when no liquid pools out from under the coconut mixture. When mixture has thickened, remove from heat and fold in chocolate chips. They will melt. Trust me. Scoop batter, about 1 inch apart, onto a parchment lined cookie sheet and bake in preheated oven for 15 minutes. Remove from oven and let cookies cool completely on cookie sheet. This will make the cookie bottoms be crisp and chewy. I used a cookie scoop to form the macaroons.